Sam loves making gnomes out of clay. Dozens and dozens and dozens of gnomes, living huddled together out in the shed. But when Sam's mum suddenly needs that space, she says the gnomes will have to go. And so Sam plans a send-off for his little clay friends - a send-off that turns into a night the family will never forget! Particularly suitable for reluctant, struggling and dyslexic readers. 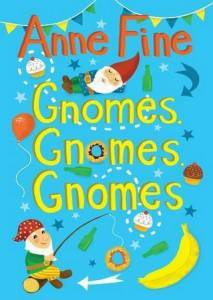 Gnomes, Gnomes, Gnomes is a book by Anne Fine for reluctant readers, illustrated by Vicki Gausden. It was published by Barrington Stoke on 15th July 2013. Click the logo to order Gnomes, Gnomes, Gnomes from .